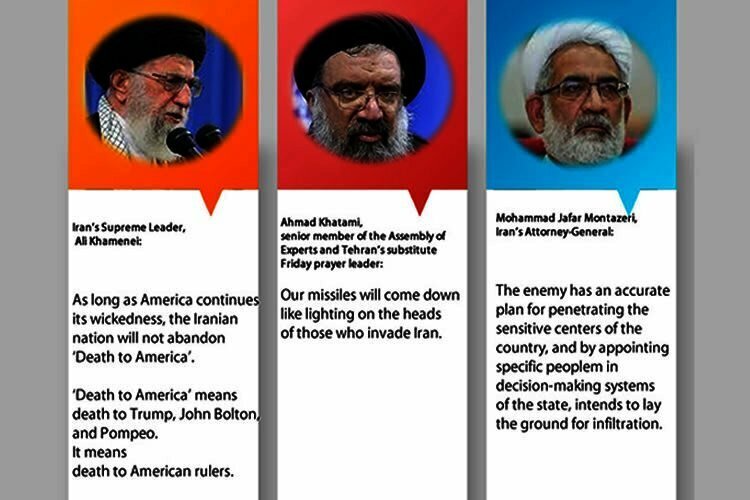 Iran’s Supreme Leader, Ali Khamenei: As long as America continues its wickedness, the Iranian nation will not abandon ‘Death to America’. ‘Death to America’ means death to Trump, John Bolton, and Pompeo. It means death to American rulers. Mohammad Jafar Montazeri, Iran’s Attorney-General: The enemy has an accurate plan for penetrating the sensitive centers of the country, and by appointing specific people in decision-making systems of the state, intends to lay the ground for infiltration. Ahmad Khatami, senior member of the Assembly of Experts and Tehran’s substitute Friday prayer leader: Our missiles will come down like lighting on the heads of those who invade Iran.